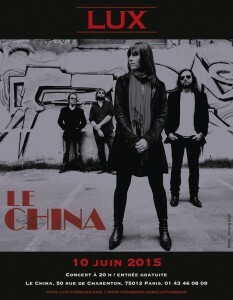 On June 10th, LUX will be playing in Paris at “Le China”. This is a small, cozy club which is near and dear to our musical hearts because it was here that Sylvain and Angela were invited to play at the very end of 2009. A home-made demo got them booked for that first gig. That chapter of this whole adventure began here; with one guitar, two voices and a whole bunch of songs. The return to Le China will be as LUX. Sylvain and Angela and Franck and Julien are going all the way to (Le) China…and back! odio Nullam lectus venenatis, eget ut sit porta.